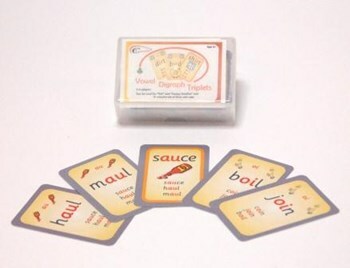 18 full-colour Vowel digraph suit sets of three, with one rhyming pair and one non-rhyming pair for each medial vowel digraph. Each sound has a key card with a picture that is repeated on the other two cards in the triplet, for visual identification of the sound. A variety of games, such as "Go Fish" as well as our own, noisy, "Bing Bang Bong" game (rules included in pack), can be played for phonics and auditory discrimination. Ideal for work with younger children, but also suitable for older students still working at this level.